The fact and force of this ministry rests upon but one passage of Scripture, in which the Spirit is said to be restraining the lawlessness of the world until He (the Restrainer) be taken out of the way (2Th 2:7). It is believed that the Spirit is the Restrainer since the restraining work is evidently undertaken by one of the Persons of the Godhead and the Spirit is the active power of God in the world during this age. The context indicates that Satan's supreme manifestations which are to be permitted in the Great Tribulation are now restrained by the Spirit until the Spirit shall have finished His work in the world and is taken out of the way. Again the scope of an important ministry of the Spirit is limited to the statement of one passage (Joh 16:7-11). This ministry likewise is to the whole world. The reproving of the world is more than a mere deepening of personal sorrow for sin; it is an indivisible threefold enlightenment of the Satan-blinded mind (2Co 4:3-4) in respect to sin, righteousness, and judgment. The sin is that of unbelief in the Saviour, the righteousness is that righteousness which is from God and is upon all who believe (Rom 1:16-17; Rom 3:22; Rom 4:5), the judgment is that finished work of Christ which is past, whereby He suffered in our place. By His reproving ministry, the Spirit causes the unsaved individual who is blinded by Satan to comprehend these three vital facts in the Gospel relative to the divine provisions for the lost. By the regenerating power of the Spirit, the one who exercises saving faith in Christ passes immediately from spiritual death to spiritual life, is made a partaker of the divine nature, Christ is begotten in him the hope of glory, God legitimately becomes his Father, and he becomes the legitimate child of God, an heir of God, and a joint-heir with Christ. This ministry of the Spirit, which was the theme of the last chapter, is one of the most vital facts concerning the Christian (Joh 7:37-39; Rom 5:5; Rom 8:9; 1Co 2:12; 1Co 6:17; Gal 4:6). Not only is the divine life in the believer through the indwelling Spirit, but the believer is so vitally joined to the Lord by the baptism with the Spirit (1Co 12:13; 1Co 6:17; Gal 3:27) that he is said to be "in Christ." To be in Christ is to have been taken out of the old creation in Adam and placed eternally in the new Creation in Christ (2Co 5:17). Christ becomes the new Federal Head and all that Christ is or has done is imputed to the believer. As a branch is grafted into the vine, or a member might be joined to a body, so the believer is vitally joined to Christ by the baptism with the Spirit. According to Scripture usage, that which has power to receive into itself, to impart its own qualities, or to exercise a controlling influence, has power to baptize, and such baptism is never a "dipping into," but rather secures an abiding position and union. The believer is brought eternally under the limitless influence of Christ by the baptism with the Spirit, and the baptism with the Spirit being a part of salvation is common to all believers. The baptism with the Spirit is the theme of the following chapter. Every child of God has been sealed by the Spirit unto the day of redemption (2Co 1:22; Eph 1:13; Eph 4:30). The Spirit Himself is the Seal and His presence speaks of divine ownership and of eternal security. It may be concluded that the Spirit's ministries in regenerating, indwelling, baptizing, and sealing are ¦wrought for the Christian when he believes, and form the very structure of his salvation, and since these blessings are never abrogated they are never wrought a second time. The filling with the Spirit is unto Christian experience, power, and service. In contrast to the once-for-all regenerating, indwelling, baptizing, and sealing, there are many fillings (Act 2:4; Act 4:8, Act 4:31; Act 6:3, Act 6:5; Act 7:55; Act 11:24; Act 13:9). According to the one great command (Eph 5:18), the believer is to be "getting filled" continuously. To be filled with the Spirit is to have the Spirit fulfilling in the heart and life all that He came into that life to do. It is not to acquire more of the Spirit, but, rather, that the Spirit acquires more of the believer. To be filled with the Spirit is to be a normal, if not a usual, Christian. 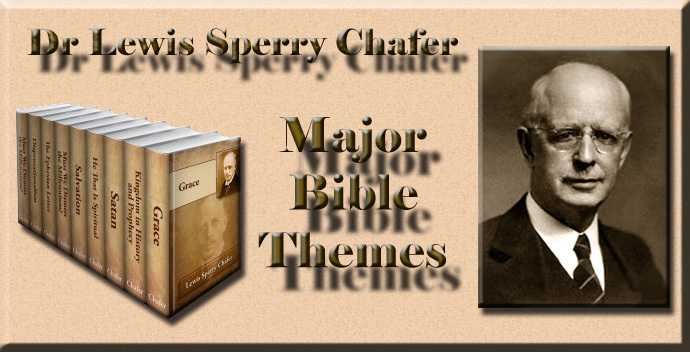 The Spirit came to do all that He does in filling, hence He needs not to be implored; He is imploring the unadjusted believer to the end that every hindrance may be removed. The Spirit's filling results in certain manifestations: (1) Christ-like character -- the fruit of the Spirit (Gal 5:22-23); (2) Christian service -- the exercise of a gift (1Co 12:4-31; Rom 12:3-8; Eph 4:7-11; 2Ti 1:6); (3) the Spirit's teaching (Joh 16:13; 1Co 2:9-10; 1Jo 2:27); (4) true praise and thanksgiving (Eph 5:18-20); (5) the Spirit's leading (Rom 8:14; Act 13:2; Gal 5:18); (6) the Spirit actualizing the unseen (Joh 16:13-15; Rom 8:16); and (7) the Spirit interceding (Rom 8:26-27). Spirituality does not consist in negatives only. We are not spiritual because we do not do worldly things. Spirituality is a vital output or accomplishment in and through the believer from the indwelling Spirit. In order to be filled with the Spirit, it is required that all sin shall be confessed (1Jo 1:9; Eph 4:30); the whole life shall be surrendered to him (Rom 6:13; Rom 12:1; 1Th 5:19); and that there shall be moment-by-moment reliance upon the Spirit (Gal 5:16). 1. Is the experience of the disciples who lived in two dispensations and through the transition from one to the other a safe guide for the Christian now? 2. Name the seven present ministries of the Spirit. 3. Who is the Restrainer and what is His undertaking as such according to 2Th 2:7? 4. Describe the reproving work of the Spirit. 5. What is the result of regeneration by the Spirit? 6. a. In whom, according to the Scriptures, does the Spirit dwell? 7. a. Into what is the believer baptized by the Spirit? b. What New Testament figures illustrate this vital union to Christ? c. Is the Spirit's baptism unto an abiding result? d. Who is baptized with the Spirit? 8. What does the sealing of the Spirit indicate? 9. a. What is the filling with the Spirit? b. In what particulars is this ministry different than His regenerating, His indwelling, His baptizing, and His sealing? c. What is the precise command of Eph 5:18? 10. What are the seven manifestations of the Spirit which together form the Spirit-filled life? 11. Does spirituality consist only in the things a Christian does not do? 12. What is the first condition of a Spirit-filled life? 13. What is the second condition of a Spirit-filled life? 14. What is the third condition of a Spirit-filled life?